The Murcia Region is one of the driest and sunniest regions in Spain. Roda Golf and Beach Golf Resort is a well-established golf resort just 2km from the warm shallow waters of the Mar Menor at Los Alcázares. The resort has a superb PGA 18 hole golf course and driving range as well as an elegant club house with fine dining or the perfect place for a drink on the terrace facilities accompanied by more casual dining. There are 17 first class golf courses within a short drive from the complex. The climate is great for golf right throughout the winter. There is a mini supermarket on the resort with several larger supermarkets within two minutes of the resort. Los Alcázares is a lovely seaside town with plazas full of bars and restaurants which spill out onto pavement terrazas and 4km of long white sandy beach with promenade. Cartagena is close by (15-20 minutes by car) with many historical sites and a cosmopolitan atmosphere in this port city that is popular with cruise ships because of it’s many shops and tapas bars. The resort has 24-hour security and parking. This apartment offers exceptional facilities and quality accommodation and superb value for money for both families and golfers alike. The flat nature of the landscape and the shallow waters of the Mar Menor mean that this resort is not just for golfers! It would particularly suit families with small children (communal playgrounds) or people with mobility challenges. It is possible to twin this apartment with another on the same site. Please specify at the time of enquiring. We provide credit on a pre-pay meter that should be ample for your stay. If you wish to run the airconditioning above and beyond normal usage then credit can be purchased locally through our agents. Good sized apartment, everything you needed. Hairdryer, full oven, fridge freezer, washing machine. Plenty of books and DVDs, sky tv (few English channels). Small swimming pool directly outside. We stayed in Feb so very quiet. Lovely golf course. Only ten minutes walk to shops (Lidl), was building Aldi opposite. And 20 minutes walk to beach. Lovely ground floor apartment with a terrace that looks onto the communal pool. Great car parking immediately outside. Well maintained and lovely and clean. All provisions that you would expect for a self-catering stay. Ideal location for exploring the Mar Menor and Murcia region. We would definitely stay her again. We stayed for 9 nights and found it perfect. There are a choice of 5 very well kept pools. 2 of which are right outside the apartment. The town of Los Alcazares is just about walkable and there are plenty of bars and restaurants to choose from. We had with us our 6 year old son though who did find it a bit too far to walk, so after a couple of days decided to get a taxi to one of the car rental places near Murcia Airport and hire a car for the remainder of our stay. Mike looked after us while we were there and was very helpful when needed. Apartment pretty much has everything you need. Clean and comfortable and when it gets too hot, the whole apartment has air con. There a 3 big supermarkets just down the road. Would definitely consider a return trip to this apartment. 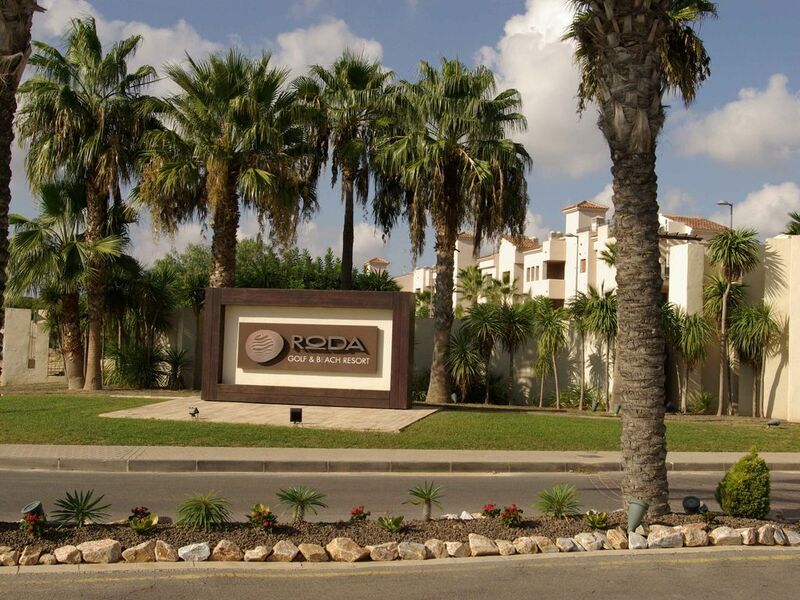 Lovely, well equipped ground floor apartment on Roda Golf Resort. It has everything you need for a great stay. Sarah and Mike, who manage the villa, are really friendly and helpful. A choice of 2 good sized pools set in attractive gardens, where there is plenty of room to sunbathe. Not too far from Los Alcazares and the beach. No Smoking inside the property The property is on the ground floor and the area is quite flat. Therefore it may be suitable for families with pushchairs/prams or guests with mobility issues.